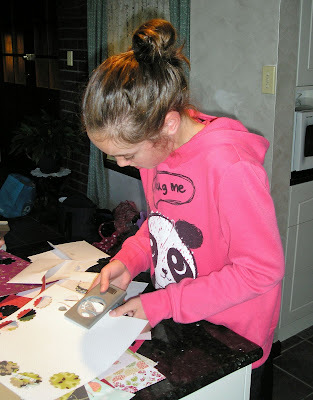 Mae has designed another great sketch for Just Add Ink's 73rd Challenge. I had a bit of fun with it and hope you do too! 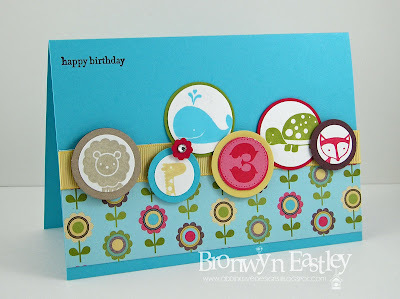 I liked the idea of putting a zip on the card to go with the Sweet Buttons Embosslits and got my inspiration from here. 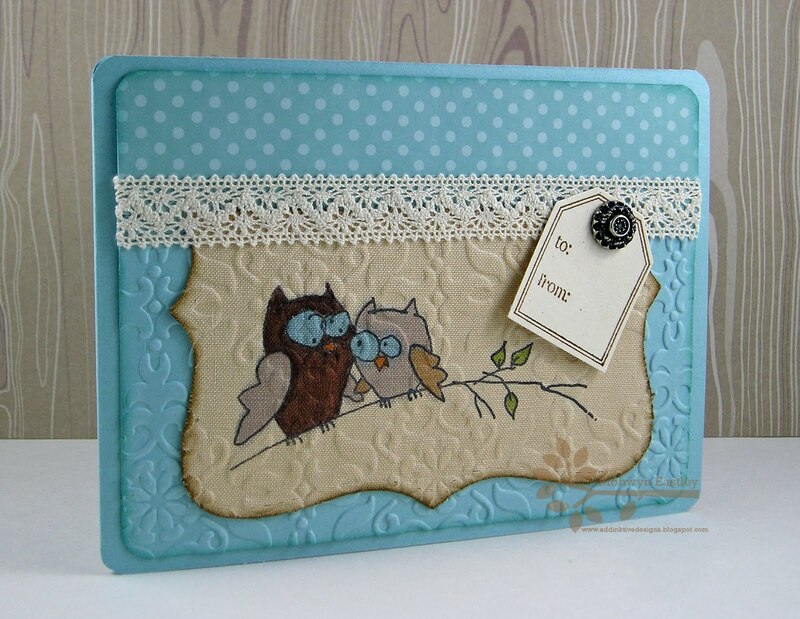 I have been trying to convince myself that I don't need the Sew Suite Stamp Set but after seeing so many innovative ways to use it, I may have had a change of heart. I love sketch challenges and the inspiration from the amazing Design Team at Just Add Ink, should be enough to get you motivated to join in too. 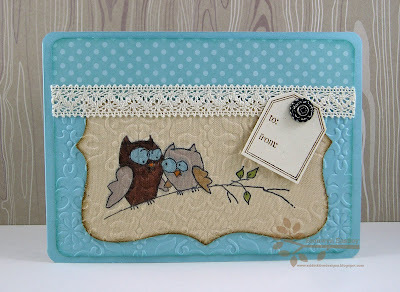 Not only do I love my Impressions Magazine for SU Demonstrators, I love the ideas that are posted on Stampin' Connection (an on-line community for Aus/NZ SU Demos). 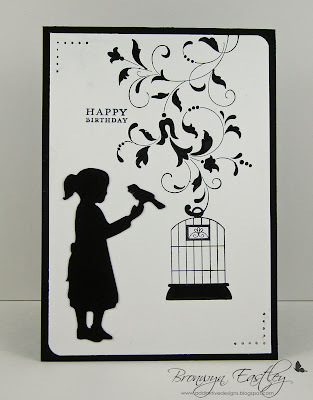 The lovely Shannon West has a video about Stamping with Shimmer Paint (not a new idea but her hints and tips are worth picking up on). 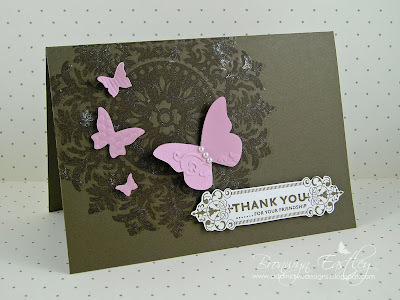 I pretty much CASED her gorgeous card but used Blushing Bride for the butterflies instead of Baja Breeze and used a sneak peak stamp from Creative Elements as a frame for the sentiment. It's hard to photograph the shimmer but you can see a hint of it. The best thing that I liked about this card is that you can make it in under 10 minutes - gotta love that!! 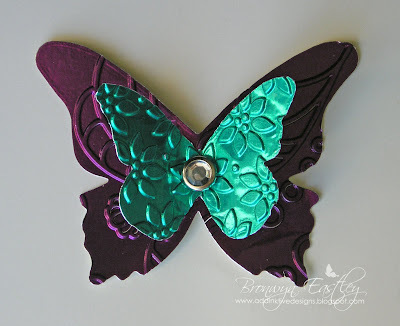 ... and just for fun, I thought I'd try out some craft foil (Spellbinders - Jewels Pack) to make a cute Butterfly Fridge Magnet using Stampin' Up's! 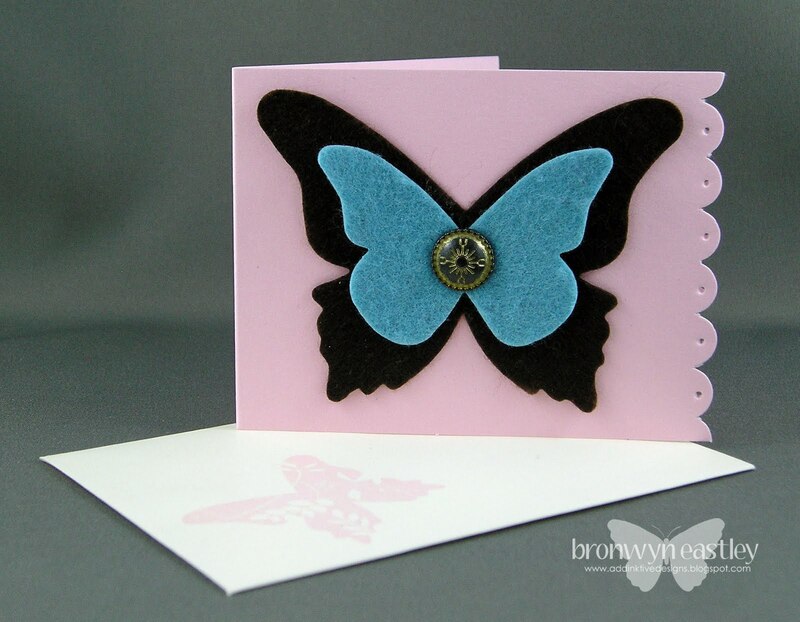 exclusive Beautiful Butterflies Die and embossing folders - Elegant Lines and Petals-a-Plenty. I love how it turned out. 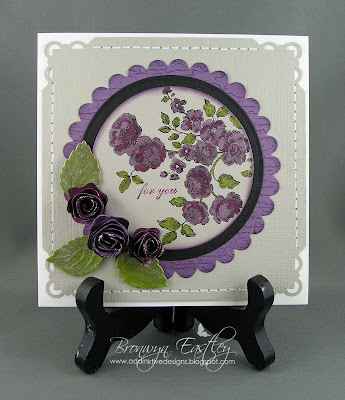 This was the Make 'n' Take for a workshop I did today. 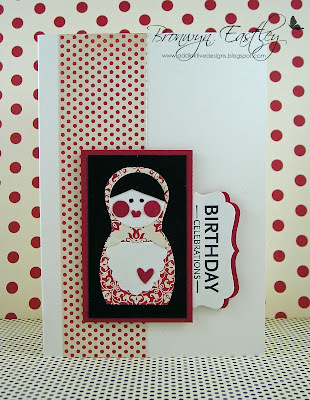 The Hostess wanted to use the 'owl punch' and I had seen these little Babushka Dolls made from Stampin' Up! 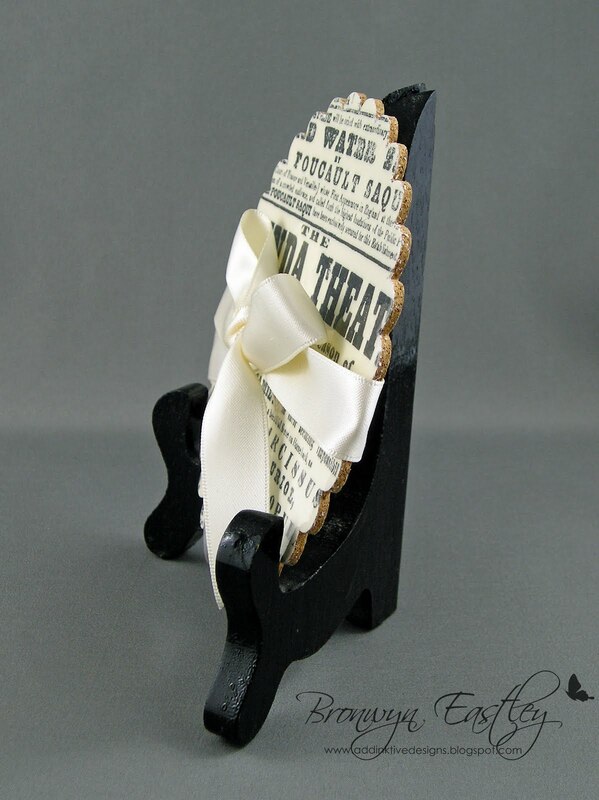 punches on Deb Fearns' Blog. 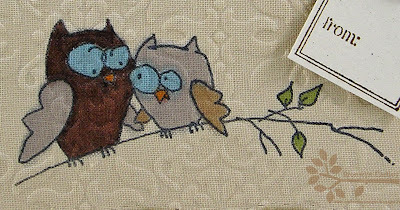 I loved the idea of using the body of the owl, combined with the wide oval, scallop oval and 1" circle punches to create something so cute. I have made the little Japanese Kimmi Dolls before so this little Russian Doll really appealed to me. 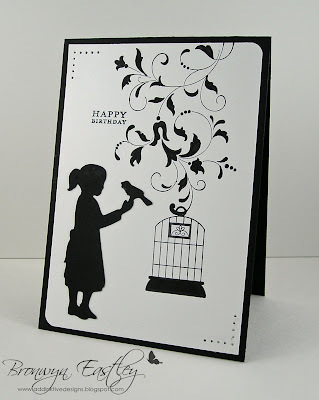 It's Friday and that means another challenge for you to enjoy at Just Add Ink. This week it's all about colouring in with either markers, water colour crayons/pencils, chalks, ink refills, shimmer paint, blender pens, aqua painters etc. I think you get the picture. I coloured the beautiful roses from the Elements of Style Stamp Set using a very fine paintbrush and a mixture of ink refills and shimmer paint. 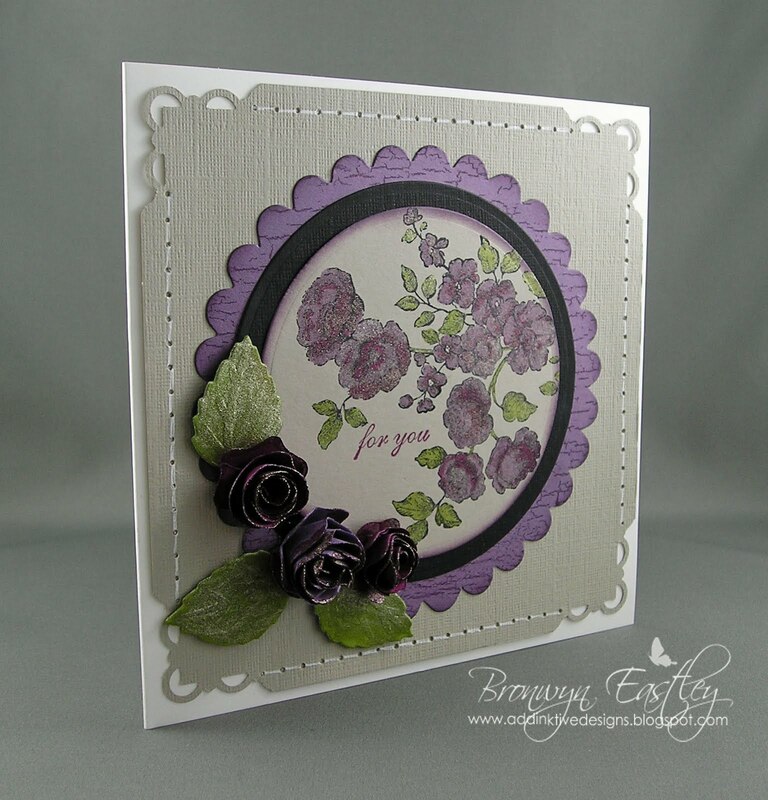 A bit of Champagne Mist Shimmer Paint was combined with a few drops from three separate ink refill colours - Perfect Plum, Rich Razzleberry and Old Olive. It is very difficult to see the beautiful sparkle that the Champagne Mist Shimmer Paint brings to the ink but you can see a hint of shine on the edges of the rolled roses. Hop on over to Just Add Ink to check out all the fabulous 'colouring in' from the Design Team. 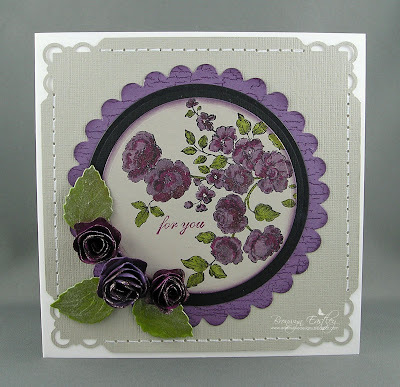 Here's another card that I made which uses the technique that Vanessa Webb demonstrated at Convention in Melbourne - embossing fabric. I stamped onto the material (100% Cotton - Tea Dye from Spotlight) with Black Staz On and coloured in Ollie and Olivia (Stampendous) using Copics and a Bashful Blue Stampin' Write Marker. I had to experiment with a few different copics and markers as some 'bled' more than others on the material. 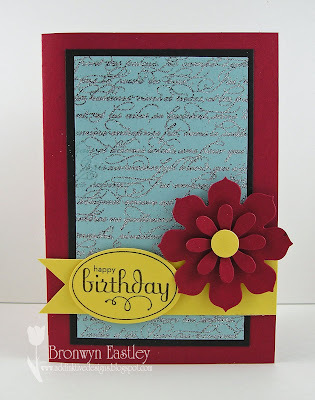 With the help of some Big Shot Multipurpose Adhesive Sheets, some Naturals Ivory Card Stock and the Top Note Die, I embossed the material using the Vintage Wallpaper Embossing Folder and sponged around the edges with Soft Suede Ink and a sponge dauber. 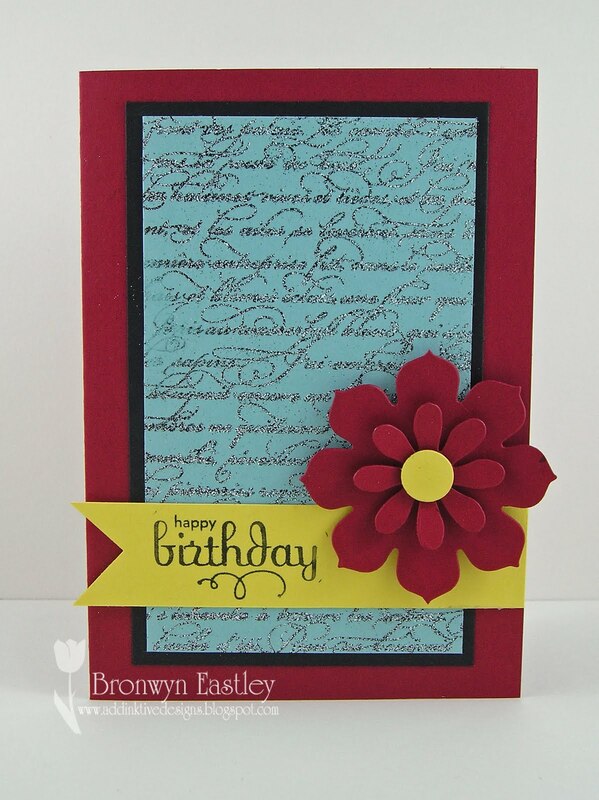 Baja Breeze Card Stock and DSP from the Subtles Pack, Corner Rounder Punch, Baja Breeze Ink for sponging, Victoria Crochet Trim, Antique Brad, To and From Tag stamp and Small Tag Punch. This was meant to be my submission for tomorrow's JAI Challenge (I don't think it will give anything away but rather keep you guessing ;) It just didn't really 'cut it' so I spent most of today making something completely different and needless to say, I'm much happier with the result. I think I have finally discovered that the Big Shot Multi Purpose Adhesive Sheets will forever be on my 'List of Essentials'. Today I made a coaster using the Scallop Circle Die, Newsprint DSP, Window Sheets (acetate), cork sheets (from Spotlight) and the BSMP Adhesive Sheets (In fact, a lot of sheets were used in the making of this project). 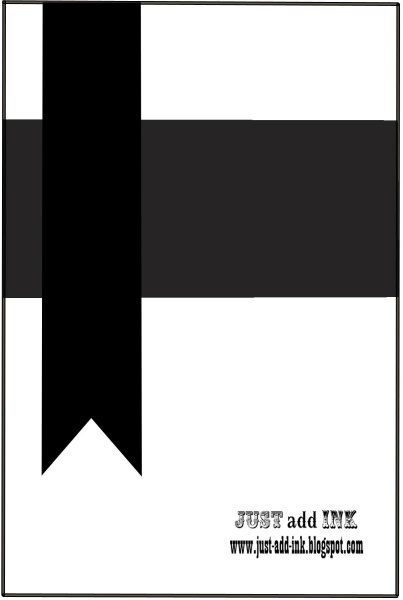 This idea comes from page 6 of the latest Impressions Magazine for SU Demonstrators (June Edition). I really love browsing through the magazine when it arrives each month to get lots of inspiration for workshops. I decided to use the Newsprint DSP as a lot of kitchens have the whole black and ivory decor thing happening (mine included). 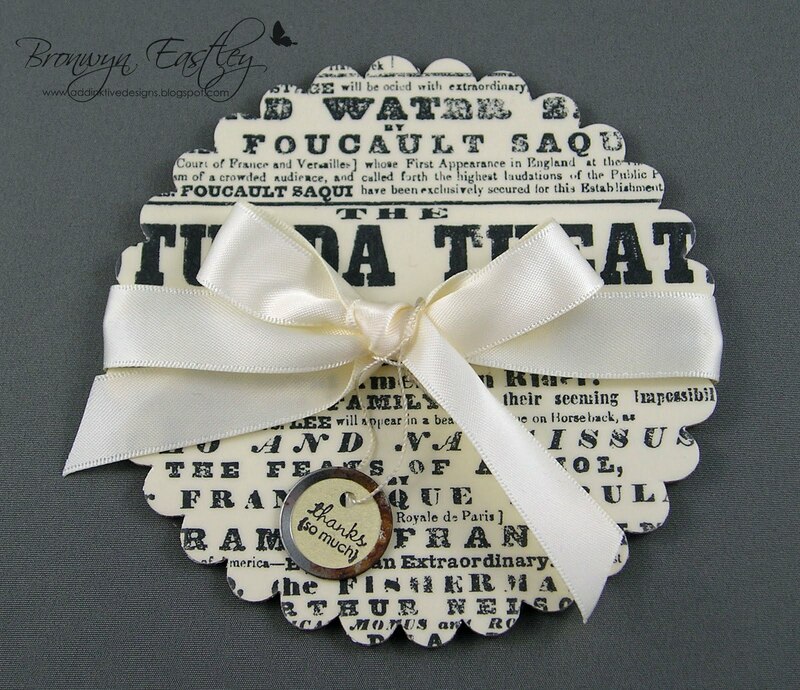 To complete the project I 'wrapped' the coaster with a Very Vanilla Satin Ribbon Bow and a Mini Vintage Tag stamped with a sentiment from Tiny Tags. I LOVE, LOVE, LOVE how it turned out. Has anyone else made these? They're a lot of fun and such a great gift idea. 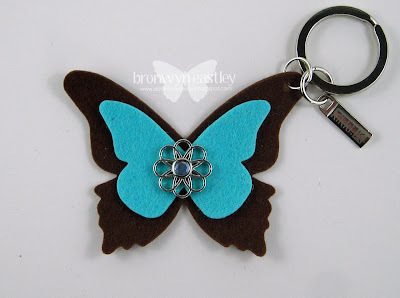 While I was at Convention in Melbourne, I managed to hop next door to the Factory Outlets and stumbled upon these great little key rings from Kikki K. I got rid of the grey felt tag and replaced it with a silver jump ring to make a felt butterfly attachment. I kept with the 'silver' theme and added a Filigree Designer and Circle Ice Rhinestone Brad to the centre. The hole in the wing was made using a Crop-A-Dile. 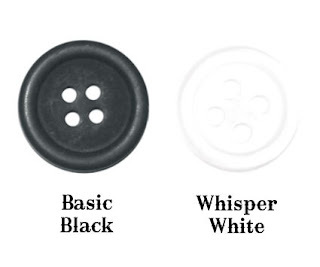 The 100% wool felt is from PTI. 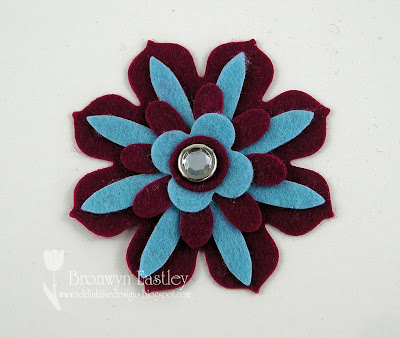 ... made with some felt from Chickenfeed and a Clear Rhinestone Brad. Isn't he the cutest? I first spotted a Two Step Owl made from cork on Stampin' Connection created by the very talented, Shirley McAvoy. She had made these as embellishments for bag tags for Convention. 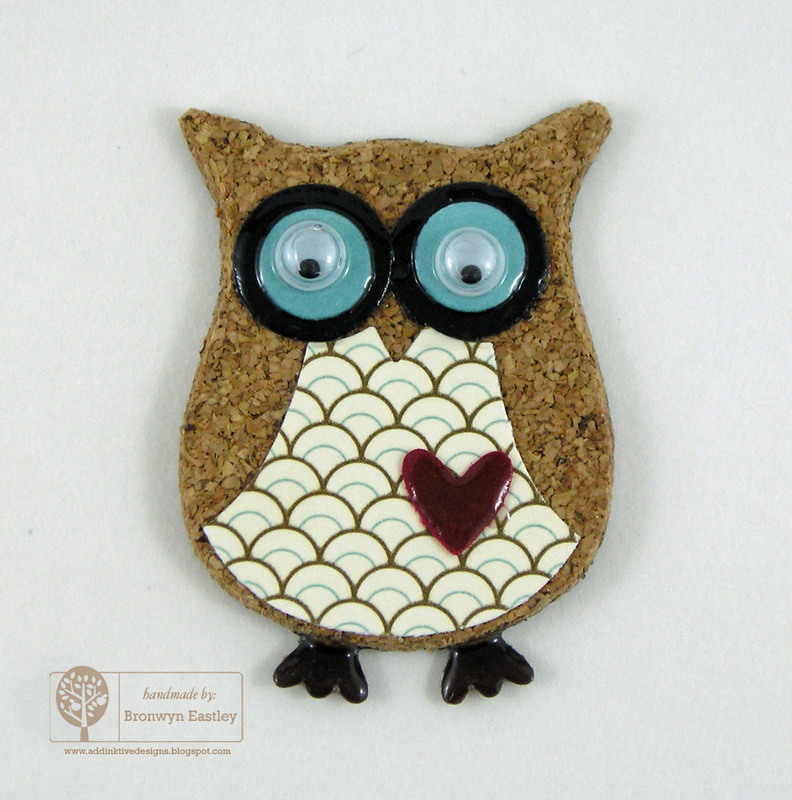 So I went in search of some cork but this particular type of cork was a bit thick for the Owl Punch so it has been hand cut. A small square of adhesive magnetic sheet was placed on the back to make a fridge magnet. 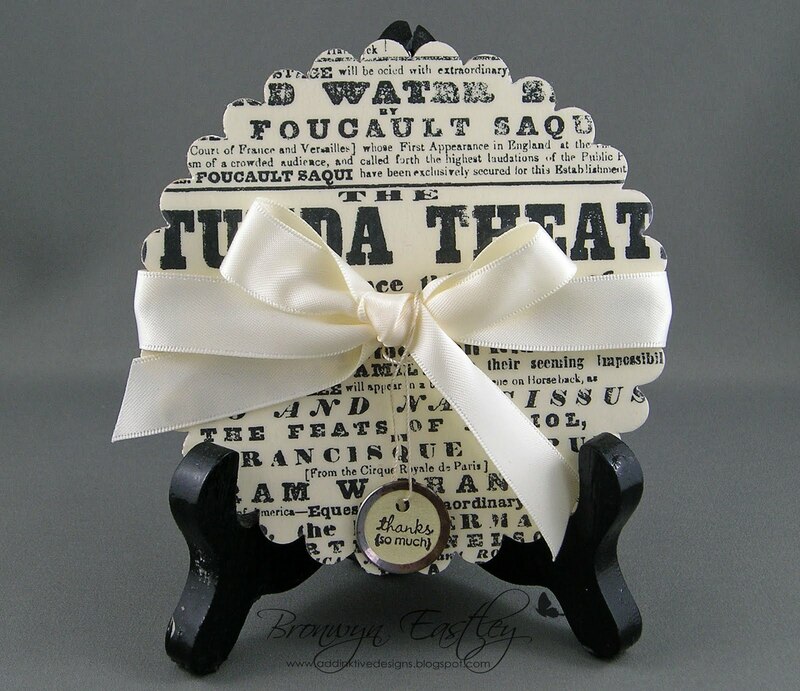 I think they make the cutest little hostess gifts. Thanks, Shirley for the inspiration. It was a long weekend here in Tassie to celebrate the Queen's Birthday (belatedly I might add) and it usually falls within our Winter holiday break. Yesterday most of my side of the family came to visit for the day. After stuffing ourselves with lots of casseroles and sweets, playing the Wii, talking cars etc. 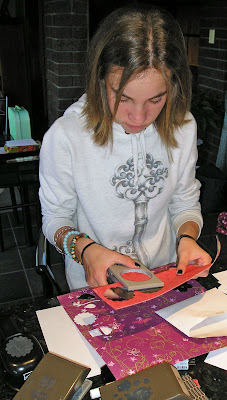 it was time to let my brother's girls have a play with Auntie Bronwyn's crafty goodies. 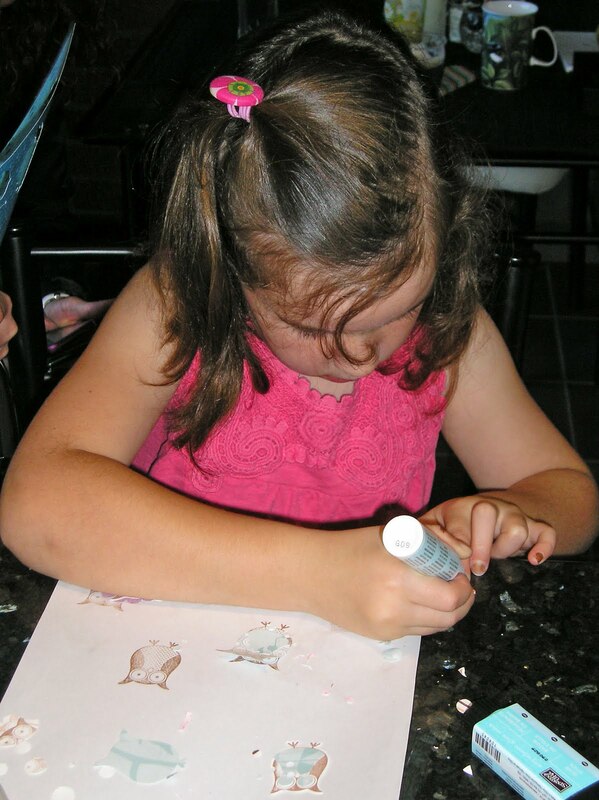 I got out 5 punches - 2 scallop circle ones, the bird and owl punches as well as the Build a Cup Cake punch and lots of retired sheets of DSP and let them have the time of their lives. Needless to say they will have fun putting all the pieces together and making some cards at home over the remainder of the holiday break. All the punched pieces got popped inside separate envelopes for a 'rainy day'. No. 2 - a possible SU Demonstrator in about 6 years time!! No. 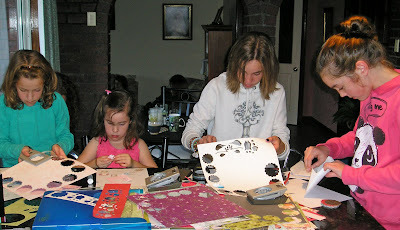 3 - taking a break in between the stamping and the punching. No. 4 - Who liked to use my two way glue to write with! 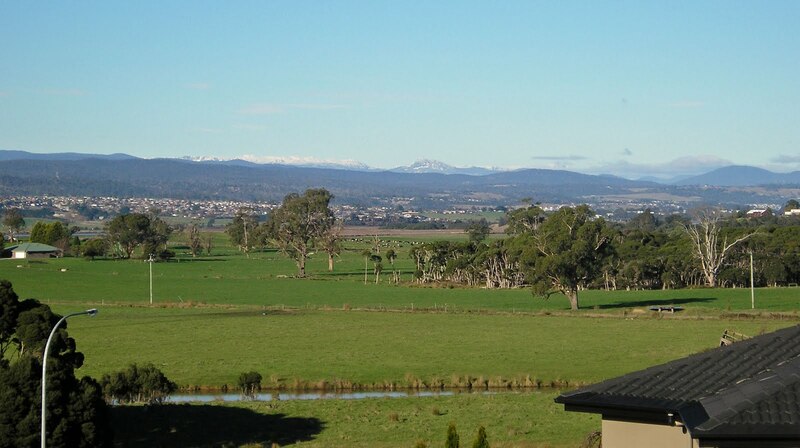 It's been an early start to the Winter season with snow on the nearby mountains. I am so thankful for the awesome view from our back yard! Ben Lomond in the distance beyond the beautiful Tamar Valley in the foreground. Hopefully, I'll be back with some crafty bits and pieces to show very soon as I have two more workshops coming up and lots of Big Shot ideas to share. Just Add Ink have a Black and White Challenge this week brought to us by the lovely and talented, Paula Dobson, to make a papercraft project using black and white ONLY. Here's my submission which has a mix of something old and something new. I hope you get the chance to join in with the challenge this week. 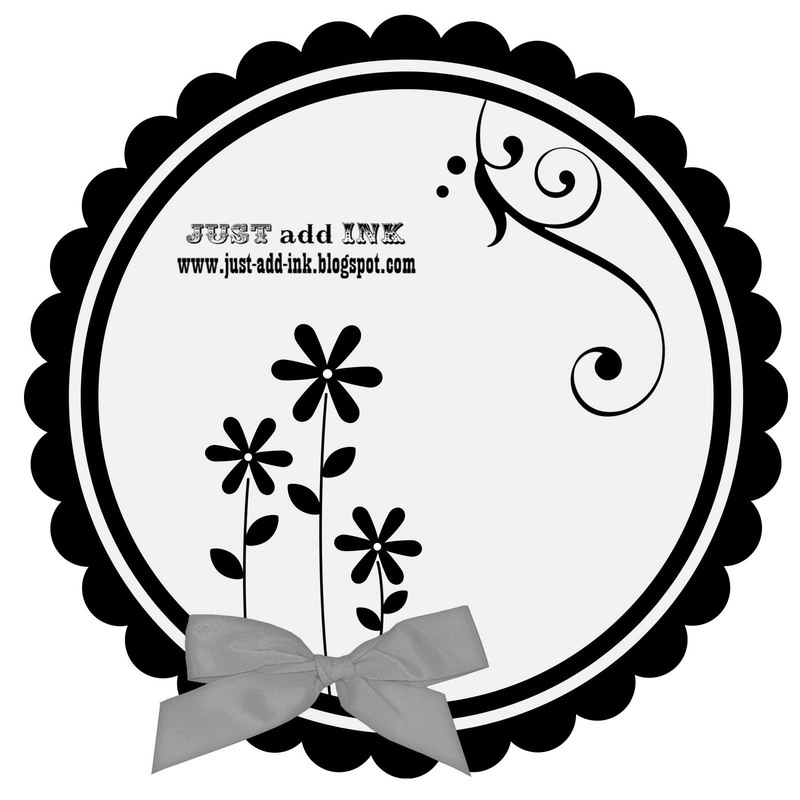 You really should pop on over to the Just Add Ink Blog and check out all the stunning examples from the other girls on the DT. 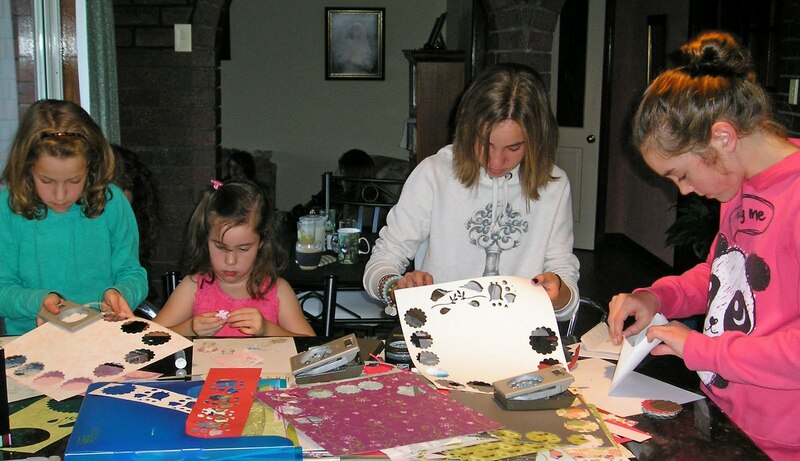 Thanks to a fantastic SU Hostess Promotion that is on at the moment, my June holiday break started with a couple of fun filled workshops. 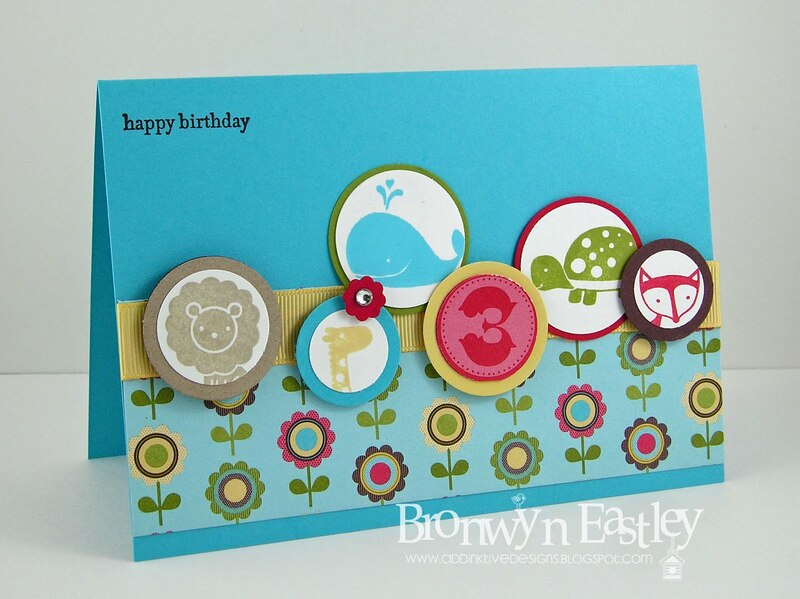 The first design was inspired by a card on page 50 of the IB & C. I used Fox & Friends instead of Cheep Talk, as one of the hostesses wanted me to design a card for the make 'n' take using this set. 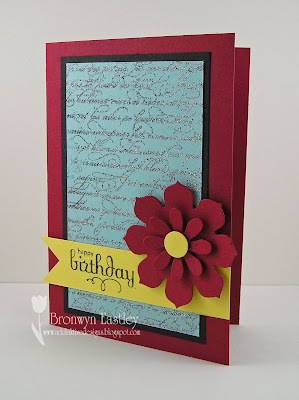 The colour combo came from the Play Date DSP and lots of circle punches and one Itty Bitty Flower Punch were used in the making of this card! I also offered Forest Friends, Funky Four and Cheep Talk as alternative stamp sets to mix and match so that everybody's card ended up being very unique. Do you recognise this? 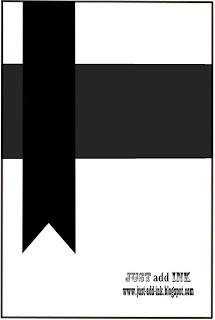 It's an idea I CASED from the May Edition of the Australian SU Demonstrator's Magazine, Impressions. 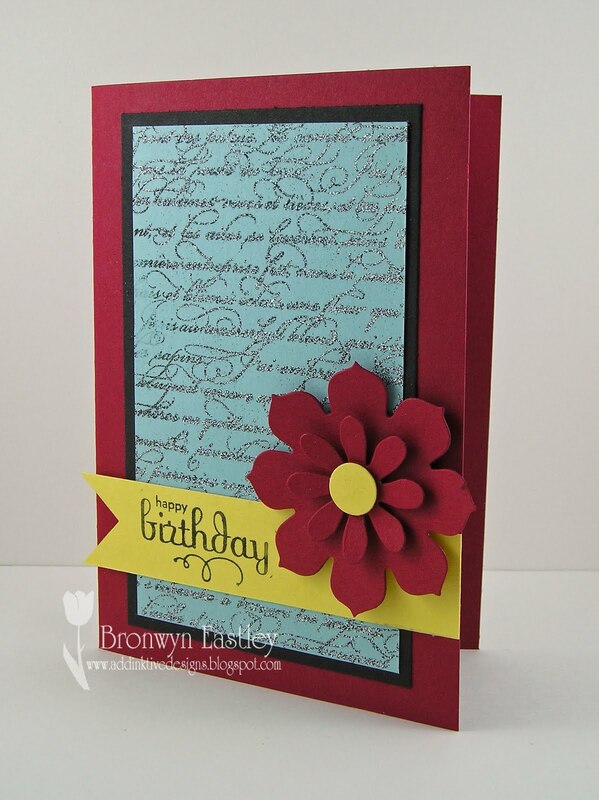 I never would have put these colours together but whoever came up with this colour combo and design, deserves a pat on the back as I love the end result (Cherry Cobbler, Daffodil Delight, Baja Breeze, Basic Black). I demonstrated mixing two colours of embossing powder together (black and white) for the En Francais background. 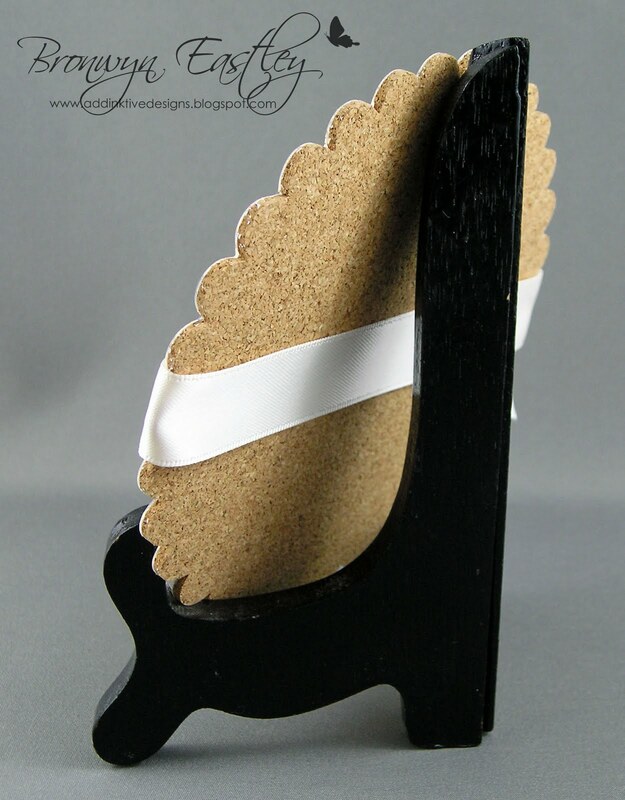 This was just a very quick demo to highlight the fact that the Big Shot can be used to cut out other stuff apart from card stock. 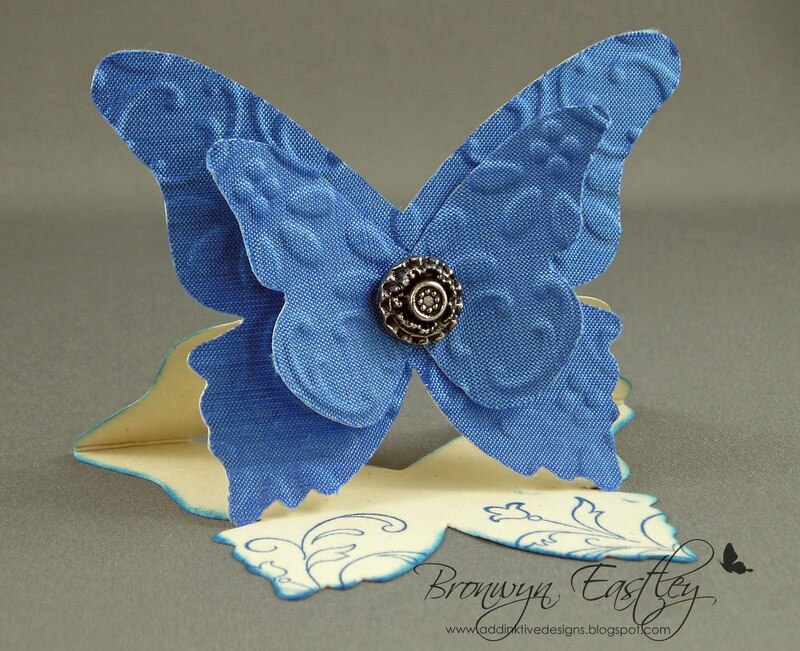 These little felt butterflies were placed on a re-created note card with an Antique Brad and a bit of paper piercing to finish it off. I'll be back on Friday with my submission for the next challenge at Just Add Ink. This week I have designed a round sketch for our 70th Challenge at Just Add Ink. If you follow my blog you'll know that I went through a 'scallop circle easel card phase' and so this round sketch is probably highly influenced by that 'era'. Now that I have re-visited my past and created yet another one of these little beauties, I wonder why I ever bother to make the occasional ordinary rectangular card! ;) ... enough said - I LOVE round cards! 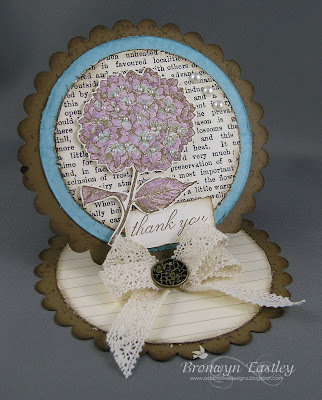 I decided to ink up, for the very first time, my Hostess L1 stamp set called, Because I Care and have a go at making a Vintage inspired creation. As you can see, the sketch does not have to be taken literally. 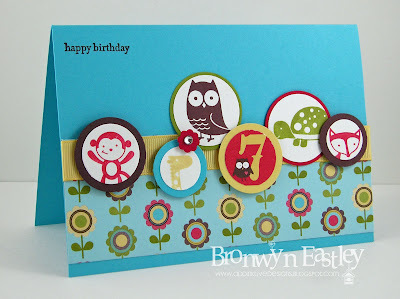 Why don't you hop on over to the Just Add Ink Challenge Blog to get some awesome inspiration from the rest of the team and link up your entry.